To Cite: Lari H, Noroozi A, Tahmasebi R. Comparison of Multimedia and SMS Education on the Physical Activity of Diabetic Patients: An Application of Health Promotion Model, Iran Red Crescent Med J. 2018 ; 20(S1):e59800. doi: 10.5812/ircmj.59800. Background: Physical activity is a vital element in diabetic patients and training of this behavior is important. Therefore, the present study aims to compare the effect of multimedia and short message service (SMS) based on the health promotion model on the physical activity of patients with Type 2 diabetes. Methods: In this clinical trial study, 37 subjects in the SMS group and 40 subjects in the multimedia group were studied. Subjects in the SMS group received training messages based on the health promotion model for 2 weeks, and the subjects of multimedia group received a teaching CD based on the health promotion model. Both groups completed the questionnaires at the beginning of the study, 2 weeks after training and 3 months after the 2nd stage. Results: The participants in the 2 groups were similar in terms of demographic variables. The comparison of the 2 groups showed that there was a significant difference between 2 groups in terms of the perceived self - efficacy (p = 0.032), benefits (p < 0.001), family (p = 0.024), and friend support (p = 0.002), however, the perceived health status (p = 0.271) and barriers (p = 0.085) had no statistically significant difference between 2 groups during the study. Additionally, 3 months after the education, the mean metabolic equivalent of task (MET) increased to 2634.71 ± 502.01 and 2614.03 ± 592.45 in SMS and multimedia groups respectively; there was no significant difference between the 2 groups (P = 0.662). Conclusions: The results of this study showed more usefulness of multimedia rather than SMS education in changing the belief of diabetic patients about the physical activity and also the effectiveness of both educational methods for promoting physical activity of diabetic patients. Diabetes mellitus is a metabolic disorder. Type 2 diabetes includes 90% of the total number of diabetics (1). The prevalence of Type 2 diabetes in Asia has risen and it has been predicted that 77.6% of people with diabetes in the 2030s will be residents in developing countries (2), also in Iran, the number of people with diabetes is expected to triple in the next 15 years (3). The cost of controlling diabetes is high and in many countries, at least 10% of the total health care budget is spent on diabetes (4). The causes of Type 2 diabetes are mostly environmental factors as well as inappropriate nutritional habits. The lack of physical activity are effective in developing of diabetes (5) and therefore, the American Diabetes Association recommends that Type 2 diabetic patients perform at least 150 minutes of moderate exercise in a week (6). Since the basis of diabetes control is self - care and the main emphasis of the health promotion model is self - regulation, therefore, the health promotion model for changing the behavior in this group of people seems to be effective. This model includes 3 groups of concepts including individual characteristics and experiences, behavioral specific cognition, and affects and behavioral outcomes. The concept of individual characteristics and experiences include prior related behavior and personal factors and the concept of behavioral specific cognition and affects including constructs of perceived benefit and barrier, self - efficacy, activity related affect, interpersonal influences (social support and norms), and situation influences. Professor Pender has identified constructs that have been effective in explaining behaviors in more than 50% of studies, which includes perceived health status, benefits and barriers, self-efficacy, and social support (7). Today, since people have a large number of preoccupations and the hardness of attendance at the training courses, researchers have used technological advances to provide health interventions. The multimedia easily communicates with users, due to the use of various audio and visual media as well as the dynamic and attractive graphics and video. Mobile phones and short message service (SMS) are also novel and interactive communication tools, which have a wide range of features such as high speed, permanent access, cost - effectiveness, storage capacity, flexibility, and content appeal (8, 9). According to Norman et al., the E - health interventions are divided into several generations: the 1st generation is the interventions in which participants us personal Computers (PCs) material, such as pamphlets; the 2nd generation is the interventions in which the training is based on the internet, CD ROM, and Pocket PCs; and the 3rd generation is the interventions in which the mobile phone is used as a Pocket PCs (10). Therefore, considering the importance of changing physical activity, the widespread use of E - health interventions as communication tools, and the lack of previous studies to compare the effectiveness of various types of E - health interventions, this study was designed and implemented to compare the effect of education program based on health promotion model using 2 E-health intervention tools (multimedia, and SMS) on the physical activity of patients with Type 2 diabetes. This clinical trial study has been carried out since October 2016 to February 2017 in diabetic patients referring to 2 governmental diabetes clinics in the city of Bushehr, a southwestern province in Iran. Inclusion criteria for this study included being able to read and write, having no diabetic foot ulcers, willingness to participate in the study, and having diabetes for 1 or more years. The exclusion criteria included functional inability to walk without a cane, inability to walk 1 mile with no rest, inability to continue participation in study for at least 3 months, and having cardiovascular disease based on medical records and participant’s report when phone call. The sample size was estimated as 36 subjects for each group based on similar study (11) with the formula as Equation 1 and with considering attrition rates (10%) in 3 months follow up, about 40 subjects were required for each groups. A total of 2 diabetes clinics were selected for sampling; reviewing 1775 records of patients in Haftom - e - Tir diabetes clinic, and 514 records in diabetes clinic of the Social Security Hospital were taking into account the inclusion criteria, 145 patients in Haftom - e - Tir and 89 patients in Social Security Hospital were determined eligible, and 80 (out of 234) patients were selected using simple random sampling. After a phone call, people who would like to participate in the study were identified and randomly divided in 2 groups of multimedia and SMS group. From 40 participants in each group, 3 patients in SMS group were not willing to continue participation in the study and were excluded. At the beginning of the study, the patients in both groups attended the clinic in a particular day determined by themselves, and completed the written consent form and then questionnaires. Appointment interval was 1 hour per day so that the researchers have enough time to complete the physical activity questionnaire through interviews and to monitor the questionnaires completion. tips about the benefits of physical activity to control blood sugar (perceived benefits), tips about the problems of doing physical activity (perceived barriers), and trainings based on step by step change of physical activity and increase it gradually over a period of 3 months and modify belief based on the usefulness of heart rate increase rising from physical activity (perceived self - efficacy). These tips have been offered to patients as educational slides with audio recording. Also, an educational CD showed 8 strength moves and 10 flexibility moves suitable for diabetic patients. A week after the package delivery, they dialed the persons number and ensured that the educational CD has been opened by asking questions about its content. In order for social support of friends and family members, the patients were asked to introduce the active family member or friends who can accompany them in performing physical activity. The special educational CD for these members have also been designed and provided, which in addition to the benefits, barriers and self - efficacy had also some advices about care, acceptance, trust, and accompanying the patient (perceived support). The educational CD was auto run and was displayed by clicking any field. In addition to the CD, multimedia group members received 2 weekly messages via SMS to 3 months later. Days 1 and 2: Training about the proper amount of physical activity to control blood sugar and physical and mental benefits of physical activity in diabetic patients (perceived benefits). Days 3 and 4: Sports rules and some tips about hiking to change physical activity step by step and gradual increase over a period of 3 months (perceived self - efficacy). Days 5 and 6: Observing some rules before physical activity in the field of blood sugar control and using or avoiding a snack before doing physical activity (perceived barriers). Days 7 and 8: Doing appropriate physical activity based on blood sugar and symptoms of low blood sugar and appropriate measures to eliminate it (perceived barriers). Day 9: Complications of diabetes and appropriate physical activity in each of them (perceived benefits). Day 10: Increasing the ability of people to have physical activity (perceived self - efficacy). Day 11: Identifying barriers to physical activity and appropriate measures to eliminate the barriers (perceived barriers). Day 12: Asking support from friends and family in care and accompaniment (perceived support). In addition, to enhance the perceived support, contact number of the active member of the family or friends of the person was taken to send a message; in addition to the benefits, barriers, and self - efficacy, recommendations on care, acceptance, trust, and accompanying the patient were sent to these people. On Friday, the people in the SMS group asked their questions from the researcher. In addition, the people in the SMS group, after 2 weeks of daily training messages, received 2 messages weekly up to 3 months. When the message was seen by the person in the SMS group, a confirmation messages was sent to the researcher from the patient. Participants in both groups, 4 weeks after the completion of the first phase questionnaires, completed the questionnaires related to constructs of HPM, and 3 months after the 2nd stage of data collection they completed questionnaires related to constructs of HPM and 7 - day recall of physical activity. Data collection tool in this study was a questionnaire, which consisted of 3 parts. The first part of the questionnaire contained information about the individual characteristics and experiences (demographic factors) such as age, gender, education, job, marital status, Body Mass Index (BMI), type of drug, duration of diabetes, and perceived health status. Height and weight of individuals were measured to determine metabolic equivalent of task (MET) and BMI. Perceived health status was determined by 12 - item short form health survey examining the physical and mental health. Cronbach’s alpha for this instrument in physical health aspect was 0.73 and mental health aspect was 0.72 (12). In this study, Cronbach’s alpha coefficient was 0.79 for all tools. The 2nd part of the questionnaire contained standard questionnaires related to constructs of HPM. Perceived benefits: Sechrist and colleagues designed this instrument for determination of agreement or disagreement with physical activity benefits by 28 questions with 4 - point Likert scale. Cronbach’s alpha coefficient of this instrument was reported 0.89 (13); in this study, Cronbach’s alpha coefficient was 0.93. Perceived barriers: individuals’ perceptions of barriers to physical activity were examined by 14 questions with 4 - point Likert scale. Cronbach’s alpha coefficient of this scale was reported 0.77 (13); in this study, it was 0.74. Perceived social support: people’s perception of family and friends support in physical activity was measured with 15 and 5 questions, respectively, with 5-point Likert scale. Cronbach’s alpha coefficients were reported 0.9 and 0.86 for family and friends support, respectively (14); in this study, it was obtained 0.92 for family support and 0.83 for the friend support. Self - efficacy: confidence of people to do regular physical activity in different conditions was evaluated by a questionnaire done by Noroozi et al. This questionnaire has 18 questions and it is answered by a percentage scale (0 to 100%). Cronbach’s alpha coefficient of the scale was reported 0.92 (15); in this study, it was 0.92. The third part of questionnaire measured the physical activity with a 7 - day physical activity recall questionnaire. The questionnaire was completed by a semi - structured interview. In the interview, subjects were asked to remember the activities done in the last 7 days, to determine the duration, intensity, and type of each activity. Then, using the instructions given in this tool, the amount of MET was calculated in the last week. The reliability of this tool was studied in several investigations by an intra - class coefficient; it had a range between 0.34-0.99 (16). In this study, intra - class coefficient was 0.78. The data were analyzed by the statistical package for social sciences software (SPSS) version 22.0. Descriptive statistics, Chi - square test, independent t - test, and repeated measurement ANOVA were used for data analysis. In this study, p - value < 0.05 is considered as significant. The participants were told that they could withdraw from the study at any time and that all information would be kept secret and anonymous. The required permissions for research were obtained from the vice chancellor of Bushehr University of Medical Sciences with Ethics Number IR.BPUMS.REC.1395.56. Written and informed consents were obtained from all the participating in the study. IRCT code was IRCT2016062928697N1. A total of 77 diabetic patients (N = 40 in multimedia and N = 37 in SMS group) completed the study. There were no significant differences between multimedia and SMS groups about demographic variables. For instance, the average age of participants in the multimedia group was 47.35 ± 8.47, and the average age in SMS group was 46.10 ± 9.14 (p = 0.497). The mean ± SD of BMI in the multimedia and SMS group were 28.05 ± 5.76 and 27.06 ± 5.19, respectively (p = 0.537), and duration of diabetes in the 2 groups were 7.55 ± 5.78 in the multimedia group and 7.72 ± 7.17 in the SMS group (p = 0.251). Other demographic characteristics were shown in Table 1. Comparison of pre and post - test results (immediate and 3 months later) in the multimedia group by repeated measurement ANOVA demonstrated an increase in perceived self-efficacy (p = 0.042), friend (p < 0.001) and family support (p = 0.044), as well as decrease in perceived barrier (p = 0.042). Comparison of pre and post - test results in the SMS group demonstrated decrease only in perceived barrier (p = 0.002). Comparison of 2 groups during the time showed that no difference noted in the scores of perceived health status, barrier, and benefit, but self - efficacy (p = 0.032), family (p = 0.024), and friend support (p = 0.002) were perceived to be higher at the multimedia group compared to SMS group (Table 2). The results showed that there were no significant differences in MET between the 2 groups (Table 3). The present study showed that multimedia training improves self - efficacy, and family and friend support for physical activity, and reduces the barriers of physical activity, however, SMS training only reduces perceived barriers for physical activity. Moreover, the MET increased in both groups, and the difference between the 2 groups had no significant differences. Self-efficacy has been defined as the determinant of physical activity behavior in several studies (17-19), therefore its promoting is an important factor in promoting the physical activity. In this study, multimedia increased self - efficacy, which is consistent with the findings of the previous study (20), however, sending short text messages could not significantly increase self - efficacy. In the study of Goodarzi et al., SMS training (21) had increased self - efficacy, which was not consistent with the results of the present study for the SMS group. In the study of Goodarzi et al., 4 messages were sent weekly for patients over 12 weeks, which indicates that the number and length of messages were more than the current study. Therefore, it seems that changing the self - efficacy requires attractive and long-lasting interventions. In this study, multimedia and short - term education could significantly reduce perceived barriers, which was confirmed by numerous studies that had provided education through face to face (22) or group (23) method. Therefore, reduction of individual perceptions of barriers with using simpler and less costly methods, including the use of multimedia and short message, is also possible. In this study, multimedia education for families of diabetic patients improved their support and then improved the perception of patients from the social support of family in the field of physical activity. In the studies that were conducted in the presence of family of patients, similar results were obtained (17, 20, 24), which confirms the findings of the recent study. However, short message training for families and friends of diabetic patients could not improve their support. Considering that no study was found with the basis of the health promotion model in physical activity with SMS training, the results of multimedia - based studies in the presence of family members (22, 25) have increased the perceived social support that was consistent with the results of the present study. Therefore it seems that multimedia education enhance family support due to containing the attractive pictures and graphics. In this study, multimedia and SMS education did not change the perception of individuals from the benefits of physical activity, which contradicted the findings of numerous studies (20, 22-24), which could be due to the high understanding of diabetic people about the benefits of physical activity at the beginning of the study. In the other words, diabetics are aware of the benefits of physical activity, and these educational practices could not provide more benefits for diabetics. Since people’s perceptions of health are influenced by several factors such as age, social class, level of education, economic status, etc., (26), therefore, it should be expected that educational interventions aimed to changing behavior did not have much effect on perceived health status. In this study, education in both multimedia and SMS did not change the perception of people from the health status. The present study showed that changing health beliefs in the field of self - efficacy, family support, and physical activity barriers could significantly increase MET and in other words, increase the physical activity in the multimedia group. In addition, in the SMS group, changing only perceived barriers was able to increase mean MET and the duration of physical activity significantly. These 2 methods of training increased physical activity and there was no significant difference between the 2 groups in terms of MET’s meanings. Accordingly, sending SMS was effective through reducing the perceived barriers as much as the multimedia method, which has been able to change beliefs of subjects in self - efficacy, barriers, and support for family. Several studies that had used the design of the curriculum in designing the model illustrate the impact of the programming on promoting physical activity (20, 22-24). In addition, in a number of studies, multimedia and SMS educations were effective to increase physical activity, not withstanding the theoretical framework (8, 11, 18, 27), all of which studies confirm the findings of the recent study. It is expected that considering the more changes in beliefs in the multimedia group, maintaining physical activity in this group in the long term will be more than the SMS group, which requires more studies. No study was found to compare these 2 educational methods, thus comprehensive and reliable comparisons between our findings with the other previous studies is not possible. Therefore, further research on non - instructive teaching methods should be conducted in the near future. Other limitation of this study can be the short follow - up period, thus further research with long follow - up period is recommended. Thirdly, the examination of health beliefs was a self - report, which sometimes tend to be overestimated; of course, due to the fact that both groups were examined with a method, this fact is true for both groups. According to the results, it seems that the designing and implementation of the educational program using the health promotion model has a positive and beneficial effect in changing health beliefs and, consequently, the creation and promotion of physical activity, especially the presentation of this educational content in multimedia is an effective method to change the health beliefs in the field of physical activity. Although providing educational content based on the health promotion model in the forms of SMS and multimedia has changed the behavior of the physical activity, providing multimedia education through changing the health beliefs has more effects than SMS education. Therefore, it is recommended that multimedia be used because of the lack requirement to time and space and the cost - effective application to change the health beliefs as well as the physical activity of diabetic patients. Authors’ Contribution: Azita Noroozi contributed to the critical revision of the manuscript, as well as ﬁnal approval of the study. Hamideh Lari contributed to the provision, collection, and assembly of study data, as well as to writing the manuscript. Rahim Tahmasebi contributed to data analysis, and critical revision. 1. Ayele K, Tesfa B, Abebe L, Tilahun T, Girma E. Self care behavior among patients with diabetes in Harari, Eastern Ethiopia: the health belief model perspective. PLoS One. 2012;7(4):35515. doi: 10.1371/journal.pone.0035515. [PubMed: 22530039]. 2. Innes KE, Vincent HK. The influence of yoga-based programs on risk profiles in adults with type 2 diabetes mellitus: a systematic review. Evid Based Complement Alternat Med. 2007;4(4):469-86. doi: 10.1093/ecam/nel103. [PubMed: 18227915]. 3. Naghibi SA, Asghari M, Rostami F. Investigation the Effect of Education on Self-Care Promotion in Type 2 Diabetic Patients in Noor Health Centers in 2015. Journal of health research in community. 2015;1(2):22-8. 4. Sharifirad G, Hazavehie S, Mohebi S, Rahimi M, Hasanzadeh A. The effect of educational programme based on Health Belief Model (HBM) on the foot care by type II diabetic patients. Iranian Journal of Endocrinology and Metabolism. 2006;8(3):231-9. 5. Rocchiccioli JT, O Donoghue CR. Diabetes Mellitus: Toward a Federal Policy. Pol Polit Nurs Pract. 2016;5(4):237-42. doi: 10.1177/1527154404269576. 6. Sigal RJ, Kenny GP, Wasserman DH, Castaneda-Sceppa C, White RD. Physical activity/exercise and type 2 diabetes: a consensus statement from the American Diabetes Association. Diabetes Care. 2006;29(6):1433-8. doi: 10.2337/dc06-9910. [PubMed: 16732040]. 7. Pender NJ, Murdaugh CL, Parsons MA. Health promotion in nursing practice. 2006. 8. Fonseca-Guedes CHF, Possa SS, Righetti RF, Juca MF, Bensenor IJM, Carvalho CRF, et al. 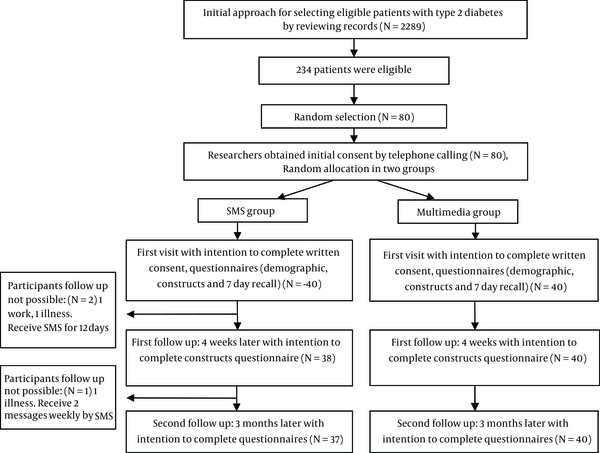 Efficacy of telephone support as a tool for promoting daily physical activity in type 2 diabetic patients. J Diabetes Res Clin Metabol. 2014;3(1):6. doi: 10.7243/2050-0866-3-6. 9. Zolfaghari M, Mousavifar SA, Pedram S. Mobile phone text messaging and telephone follow-up in Iranian type 2 diabetic patients for 3 months: a comparative study. Iranian Journal of Diabetes and Obesity. 2009;1(1):45-51. 10. Norman GJ, Zabinski MF, Adams MA, Rosenberg DE, Yaroch AL, Atienza AA. A review of eHealth interventions for physical activity and dietary behavior change. Am J Prev Med. 2007;33(4):336-45. doi: 10.1016/j.amepre.2007.05.007. [PubMed: 17888860]. 11. Zolfaghari M, Mousavifar SA, Pedram S, Haghani H. The impact of nurse short message services and telephone follow-ups on diabetic adherence: which one is more effective? J Clin Nurs. 2012;21(13-14):1922-31. doi: 10.1111/j.1365-2702.2011.03951.x. [PubMed: 22239205]. 12. Montazeri A, Vahdaninia M, Mousavi SJ, Omidvari S. The Iranian version of 12-item Short Form Health Survey (SF-12): factor structure, internal consistency and construct validity. BMC Public Health. 2009;9:341. doi: 10.1186/1471-2458-9-341. [PubMed: 19758427]. 13. Sechrist KR, Walker SN, Pender NJ. Development and psychometric evaluation of the exercise benefits/barriers scale. Res Nurs Health. 1987;10(6):357-65. [PubMed: 3423307]. 14. Noroozi A, Ghofranipour F, Heydarnia AR, Nabipour I, Amin Shokravi F. Validity and reliability of the social support scale for exercise behavior in diabetic women. Asia Pac J Public Health. 2011;23(5):730-41. doi: 10.1177/1010539509357342. [PubMed: 20460282]. 15. Noroozi A, Ghofranipour F, Heydarnia AR, Nabipour I, Tahmasebi R, Tavafian SS. The Iranian version of the exercise self-efficacy scale (ESES) Factor structure, internal consistency and construct validity. Health Educ J. 2011;70(1):21-31. doi: 10.1177/0017896910374547. 16. Sallis JF, Haskell WL, Wood PD, Fortmann SP, Rogers T, Blair SN, et al. Physical Activity Assessment Methodology in the Five-City Project1. Am J Epidemiol. 1985;121(1):91-106. doi: 10.1093/oxfordjournals.aje.a113987. 17. Chung SK. Effects of interactive multimedia for the prevention of obesity on self-efficacy, beliefs about physical activity, and social influence. University of Southern California; 2004. 18. Goran MI, Reynolds K. Interactive multimedia for promoting physical activity (IMPACT) in children. Obes Res. 2005;13(4):762-71. doi: 10.1038/oby.2005.86. [PubMed: 15897486]. 19. Wang LW, Ou SH, Tsai CS, Chang YC, Kao CW. Multimedia Exercise Training Program Improves Distance Walked, Heart Rate Recovery, and Self-efficacy in Cardiac Surgery Patients. J Cardiovasc Nurs. 2016;31(4):343-9. doi: 10.1097/JCN.0000000000000246. [PubMed: 25774840]. 20. Mahdizadeh M, Peymam N, Taghipour A, Esmaily H, Mahdizadeh SM. Effect of health education program on promoting physical activity among diabetic women in Mashhad, Iran: applying social cognitive theory. J Res Health Sci. 2013;13(1):90-7. [PubMed: 23772021]. 21. Goodarzi M, Ebrahimzadeh I, Rabi A, Saedipoor B, Jafarabadi MA. Impact of distance education via mobile phone text messaging on knowledge, attitude, practice and self efficacy of patients with type 2 diabetes mellitus in Iran. J Diabetes Metab Disord. 2012;11(1):10. doi: 10.1186/2251-6581-11-10. [PubMed: 23497632]. 22. Noroozi A, Tahmasebi R, Ghofranipour F. Effect of health promotion model (HPM) based education on physical activity in diabetic women. Iranian Journal of Endocrinology and Metabolism. 2011;13(4):361-7. 23. Sanaeinasab H, Saffari M, Pakpour AH, Nazeri M, Piper CN. A model-based educational intervention to increase physical activity among Iranian adolescents. J Pediatr (Rio J). 2012;88(5):430-8. [PubMed: 23093099]. 24. Fahrenwald NL, Atwood JR, Walker SN, Johnson DR, Berg K. A randomized pilot test of "Moms on the Move": a physical activity intervention for WIC mothers. Ann Behav Med. 2004;27(2):82-90. doi: 10.1207/s15324796abm2702_2. [PubMed: 15026292]. 25. McEwen MM, Pasvogel A, Murdaugh C, Hepworth J. Effects of a Family-based Diabetes Intervention on Behavioral and Biological Outcomes for Mexican American Adults. Diabetes Educ. 2017;43(3):272-85. doi: 10.1177/0145721717706031. [PubMed: 28447545]. 26. OECD . Perceived health status. Society at a Glance 2016: OECD Social Indicators. Paris: OECD Publishing; 2016. p. 116-7. doi: 10.1787/soc_glance-2016-22-en. 27. Bell AM, Fonda SJ, Walker MS, Schmidt V, Vigersky RA. Mobile phone-based video messages for diabetes self-care support. J Diabetes Sci Technol. 2012;6(2):310-9. doi: 10.1177/193229681200600214. [PubMed: 22538140].